I was standing outside my house and was overlooking the farm last year in May 2011; and while looking towards the north and seeing the stream flowing towards Klipdrift dam, I just saw a picture of Mighty Men 2010; the huge stage and the thousands of men worshipping and praising the Lord. It just suddenly fell onto me because I wasn’t thinking about anything specifically. I shared the vision with my wife Hannelie and she just said; cool, go for it! I protested and said, what must I go for, and she was just smiling and suddenly I realized that she meant I must arrange such an event! But I had to be certain and wanted confirmation from the Lord Himself. One morning I drove to work from the farm and the sun was just rising over Losberg (Standalone Mountain next to our town – Fochville). This was such a beautiful picture that only God Himself could paint, and I was just praising the Lord for His greatness and the beautiful nature! The next thing I heard the Lord saying to me; Jan when are you going to start? I immediately knew that the Lord was referring to the event that I must arrange. Various people gave me word that confirmed that I must carry on with arranging the event. I was so amazed and I knew that I must be obedient and do what the Lord was asking. I decided to contact Oom Angus (1 October 2011), and if he is willing and have the time to be one of the speakers then it will be the final confirmation. Two weeks later I received an email from him and it goes like this; “although it is still a long time ahead and he cannot commit to the date (26-28 April 2013) yet, he will pray and think about coming to the event”. Oom Angus also had one requirement and that was that he wants to fly in and out the same day! I knew that the costs for private charters are quite expensive and called my friend as he is a pilot working for SAA and he was the only person that I know off, who might give me information about private charters. I contacted Burger and explained my vision as well as the requirements of oom Angus; within 30 minutes he emailed me from New York and said the airplane was organized and paid for! Wow, then I knew this can only be from the Lord! The Lord also gave me the theme and the date for the event: “Father and sons” (26-28 April 2013). This is also my calling in life - working with fathers and sons. Wow again! This was huge and the following morning I suddenly awaken with the thought, this is too big for me and I am not worthy, I am just an ordinary man working for a salary, and I don’t have that kind of resources to organize such an event and don’t have the knowledge nor the experience; but the Lord said to me; you are worthy and with my power and strength in you, and together with a team of Godly people you will be able to arrange this event! I repented to the Lord because I know that He made me a leader of men and that I have listened to the enemy that I am not worthy! One morning I made the decision and proclaimed; Lord with You behind me I will do it! We are staying in a mining community about 100km west of Johannesburg, 50km from the Westrand/Soweto, and 25km from Potchefstroom, so we are really close and accessible to the city and many people! 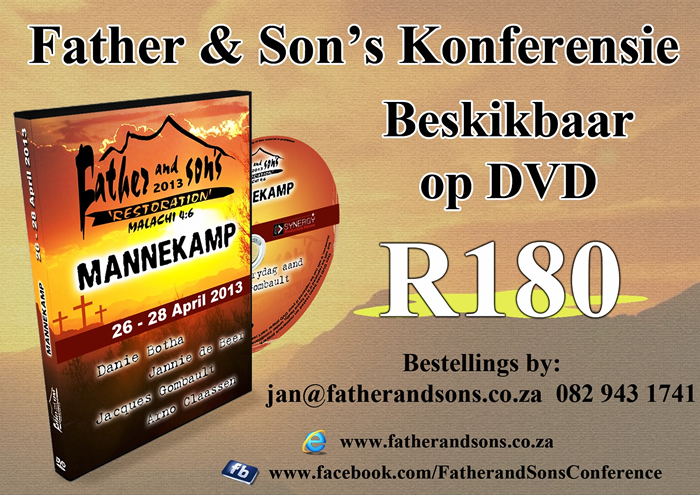 Relationships between our Father and his sons as well as the physical relationship between Father and son. Reconciliation between black and white – we need to draw the black community in! The mining community is battling with poverty, retrenchments, unemployment and a sinful life! This town Fochville with its own mountain (Losberg) is a very special place where revival is currently taking place, and over the last 10 years many people went up the mountain to pray for this little town. Many prophesies was also spoken out over this town and we are seeing the word coming into action, this town and his people will impact the world! The one thing (word) that was confirmed over and over again was that there will be a big event soon which will draw people closer to God and closer to each other, so I believe this is it: Father and sons 2013!